Until this afternoon, it was a near consensus that deGrom was likely staying put this season and especially not heading to his team’s crosstown rival in the Bronx. However, news broke today that deGrom’s agent has a not so subtle request for Mets’ management: Sign deGrom long-term or trade him. This is obviously paraphrased, but deGrom’s agent made his intentions pretty clear in a statement to Ken Rosenthal. “We have discussed Jacob’s future with the Mets at length. Jacob has expressed interest in exploring a long-term partnership that would keep him in a Mets uniform for years to come. If the Mets do not share the same interest, we believe their best course of action is to trade him now.” The Mets are dead last in the NL East and do not appear to be heading in a positive direction. If they do have no intentions of locking up their staff’s ace, they would be foolish on not trying to negotiate with the Yankees. A Yankees and Mets deGrom trade is a match made in heaven. The Yankees need an ace. deGrom is an ace. The Mets need a prospect haul that would steer them in the right direction. The Yankees have a top-three farm system in the entire sport. The issue that essentially shuts down any trade speculation as soon as it is initiated is the media disaster that would follow a blockbuster between the two New York teams. However, if Brian Cashman is on board with shipping a haul of young players to the Mets, the Mets should do the right thing for their franchise's future and follow suit by shipping the Yankees their ace. 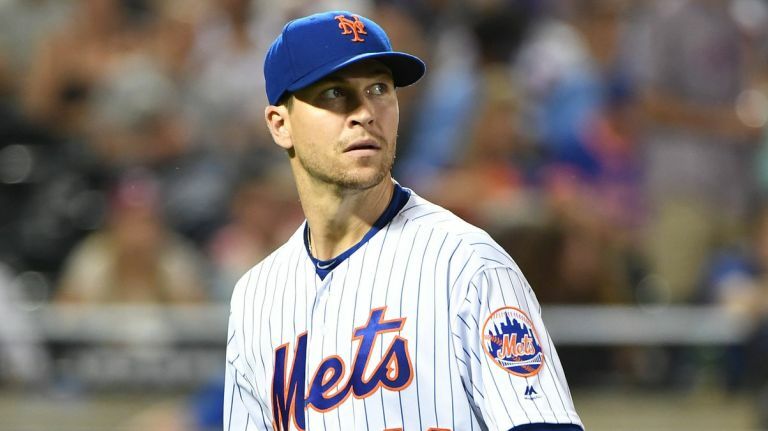 Of course, the Mets would cringe at even the thought of seeing deGrom bringing home a ring in a Bronx uniform, but if it meant they got back several players that could theoretically do the same for them a few years down the roads, it is a risk both teams have to take. If the Mets make deGrom available and avidly shop him, there is not a doubt in my mind that the Yankees would give them the best offer as long as the Mets let go of the fact they are not going to be acquiring Gleyber Torres. The Mets have gone down the road where they take a lesser offer for one of their players, despite the Yankees showing heavy interest. Last season, the Yankees were rumored to be willing to part ways with Domingo German and another prospect for Jay Bruce. Instead, the Mets shipped him to Cleveland for a player named Ryder Ryan who is a 23-year-old reliever that has not pitched above Double-A. If the Yankees offered a combination of Florial/Frazier, Sheffield, Andujar, and one or two lower level prospects for deGrom, there is no team that could even come close to matching this offer, and the Mets need to open their eyes and see this. A once completely disregarded union of deGrom and the Bombers suddenly has a little bit of life, after today’s comments from deGrom’s agent. In all likelihood, the Mets remain stubborn and act as if the Yankees don’t exist when negotiation time comes around, but this new sense of urgency created by deGrom’s agent along with the Yankees’ dying need for a starting pitcher could create a New York and New York trade miracle no one saw coming.